Leave all your worries behind and escape into the world of "Hilda"
Netflix‘s new animated show „Hilda” is like a cup of warm tea with honey when you have a sore throat, or like a cat that comes to curl into your lap when you’re feeling down. 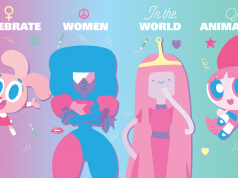 It’s optimistic and good-natured, without pandering or sugar-coating. And all of us, adults and kids, need some genuine feel-good stories in our lives, right? Based on a series of books by Luke Pearson, „Hilda” is set in a pastel-coloured world where strange animals and mythical creatures co-exist with regular humans as we know them. (Nobody bats an eye at this, of course.) The titular Hilda is a blue-haired little girl who must move with her mother from a cottage in the middle of nowhere to the vibrant city of Trolberg, exchanging their peaceful life in the wilderness for new adventures. The reasons for the move are told in the first couple of episodes, and set the tone for the show’s general approach: Hilda is inspiring because she’s brave, confident, and intelligent, but she doesn’t always get what she wants, and she must accept that life has disappointments as well. 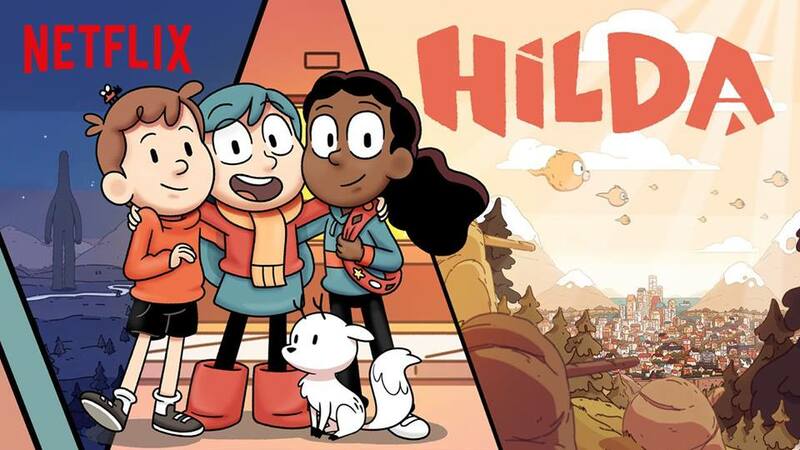 „Hilda” is a series that carefully considers the perspectives and needs of other characters, too, be they humans, giants, elves or sentient onions, which makes it good viewing material if you’re looking to raise thoughtful, empathetic kids. Hilda can befriend anyone, no matter how bizarre their appearance, but her friends are not there just to serve her purposes. 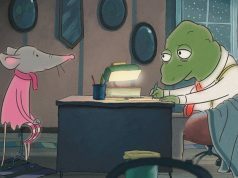 Hilda’s mom is also a refreshing take on a parent in a children’s show: she has her own job and her own wishes and disappointments; she’s supportive of Hilda but she doesn’t go along with every crazy idea. „Hilda”‘s universe and aesthetic bring to mind many things, from the Moomins to Miyazaki movies and „Gravity Falls”, but it’s also very much its own thing. I loved the character design of its many strange animals, such as Hilda’s pet Twig, who seems to be a mix between a dog, a fox and a deer. The soundtrack has a pleasant, dreamy 80’s electronic pop vibe, with a main theme by Grimes (which came out a bit generic, though, considering its creator). 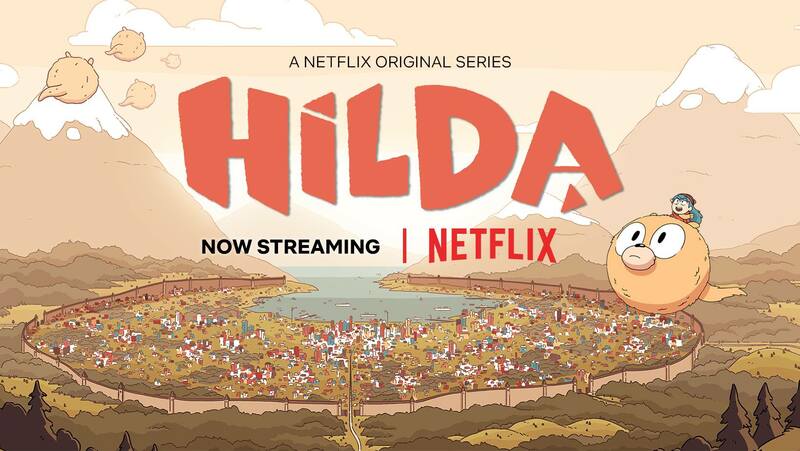 I most liked „Hilda” for how relaxing and sincere it is; the show doesn’t care too much if adults are watching. 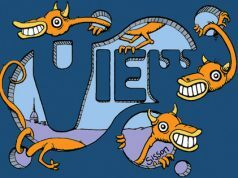 I’m a bit tired of gritty TV series for grown-ups full of violence and heartbreak; I’m also a bit tired of the detached irony and subtext present in a lot of other kids’ shows. Some of the later episodes could get a bit scary for younger viewers, and I admit I like Hilda’s fantastical friends much more than the human ones, but a cartoon where, for example, a poltergeist cleans up your room instead of messing it up is exactly what we all need in our lives right now.